Image from Reddit. Creator unknown. On Friday, hundreds of US parents protested against the vaccination of children. I liked the Huffington Post headline: Parents Protest For Kids’ Right To Suffer From Preventable Illness. The protest was in Washington State, which is currently in the middle of a measles epidemic. The parents are trying to stop a bill that would remove personal or philosophical exemptions for child vaccination. It’s an attempt to stop a dangerous trend: the WHO describes the anti-vaccination movement as one of the top threats to global health in 2019. The anti-vax movement is profoundly anti-scientific, and repeats the non-existent link between autism and vaccination popularised by the thoroughly discredited charlatan Andrew Wakefield. Wakefield, sadly, is still peddling his nonsense and thousands of parents believe it. It’s important to stress here that vaccines are among the most studied medicines in human history. There is no link between vaccination and autism. None. The parents who campaign against keeping children alive aren’t malicious. But they’ve fallen victim to the same thing that drives climate change denial or flat-Earthism: I can’t see it, therefore it can’t exist. It also ties in with anti-government, anti-expert sentiment. How dare you tell me what I need to do to protect my children? It’s cruelly ironic that vaccines have fallen victim to their own success: we no longer see the victims of the diseases they eliminate. My generation and the generations after me haven’t grown up around children whose limbs have been destroyed by polio. We haven’t seen people’s faces scarred and distorted by smallpox. We don’t know of brothers or sisters who died from whooping cough. If we can’t see it, it doesn’t exist. The parents’ murderous delusion could kill not just their own children, but other people’s children too. Some children don’t have the luxury of choosing whether to be vaccinated or not: they’re too young, or they don’t have access to health care, or they have medical conditions that would make vaccination unsafe, or they’re still in the womb. With a successful vaccination programme those children are protected: herd immunity means that it’s effectively impossible for dangerous diseases to exist in a community, so the likelihood of these children being exposed is near zero. 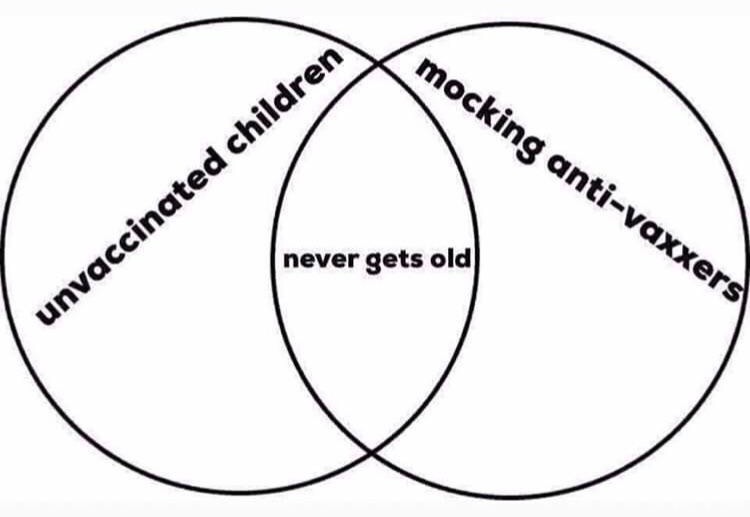 That only works if most children get vaccinated, though. When the numbers fall even a little bit, below 90 to 95%, herd immunity disappears and preventable, deadly diseases recur. That’s exactly what’s happening now. For example, in Clark County – part of the same state where the anti-vaxxers were protesting – just 78% of nursery school children have had the full slate of vaccination. 43 of those unvaccinated children have contracted measles. In the US alone, more than 9 million children are currently at risk of contracting measles as a result of under-vaccination. This isn’t an argument to be won on facts, on debating whether or not vaccines are safe. The anti-vaxxers have seen the evidence and simply choose not to believe it. The only way to change these people’s minds appears to be to show them the horrific consequences of the diseases the vaccines prevent, and the danger they’re putting so many children in.